Refreshing a canvas duffle bag with appliqués made from fabric remnants. This is done to cover up some printed company logos on each sides of the bag. 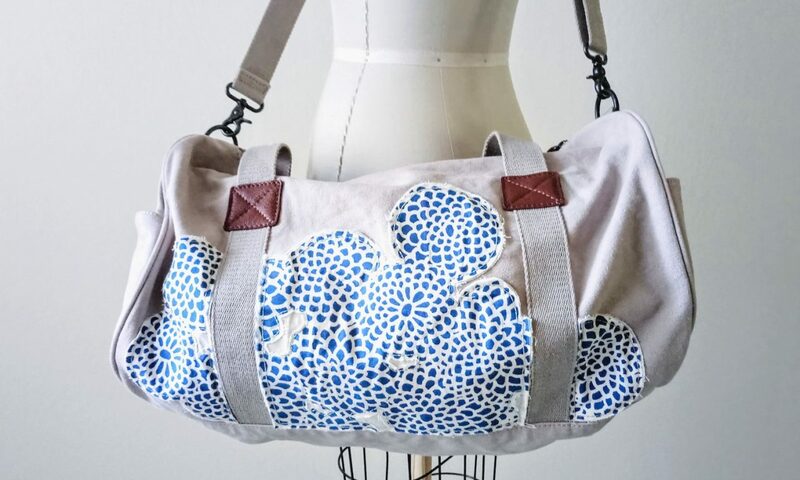 The main materials for this DIY Fashion project were duffle bag, Sou Sou printed cotton fabric remnant and some muslin remnants. Embroidery floss and needle, fabric glue, stop fray liquid, as well as double-duty thread and needle completed the list. After a few hours of layering and hand stitching the appliqué pieces, this bag is now ready to go on trips with us! Read more about this DIY by visiting Duffel Bag Personalization with Fabric Appliqués post. DIY appliqué duffle bag by decorating a canvas bag with appliqué handwork. This bag is now personalized and ready to travel!